Hello and welcome to my Izanami descend guide. This is a reasonably tricky descend and has numerous special boss abilities throughout the dungeon, but does provide two different boss drops: Light Izanami and Dark Izanami with the dark form evolving into one of the most coveted farmable subs in the game, Pacifying Yomi Goddess, Izanami. Do note the numbers follow a legendary (Mythic) pattern. Without further ado, let us jump right into the action! The following video was recorded at a later date so the images will not match! 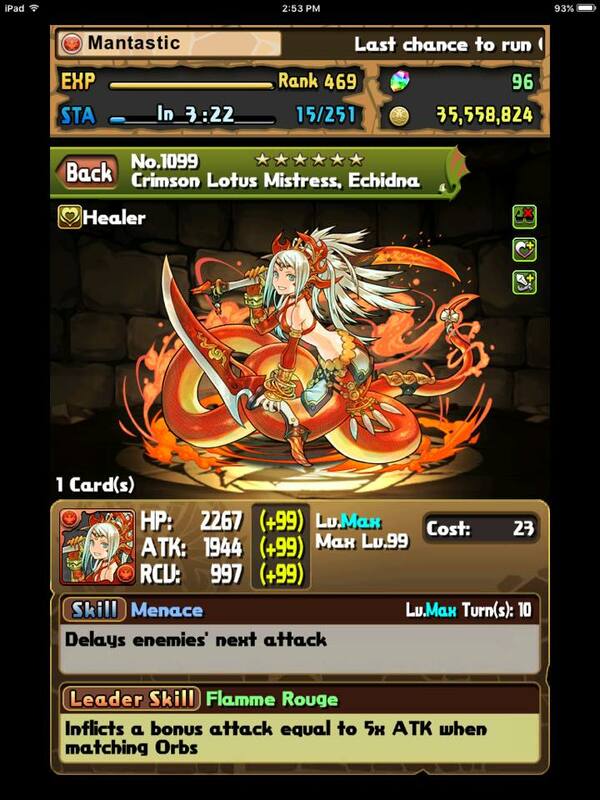 Also known as Crimson, Lotus Mistress, Echidna, she is one of the first valuable farmable monsters a new account can acquire and was actually my third hyper maxed monster. 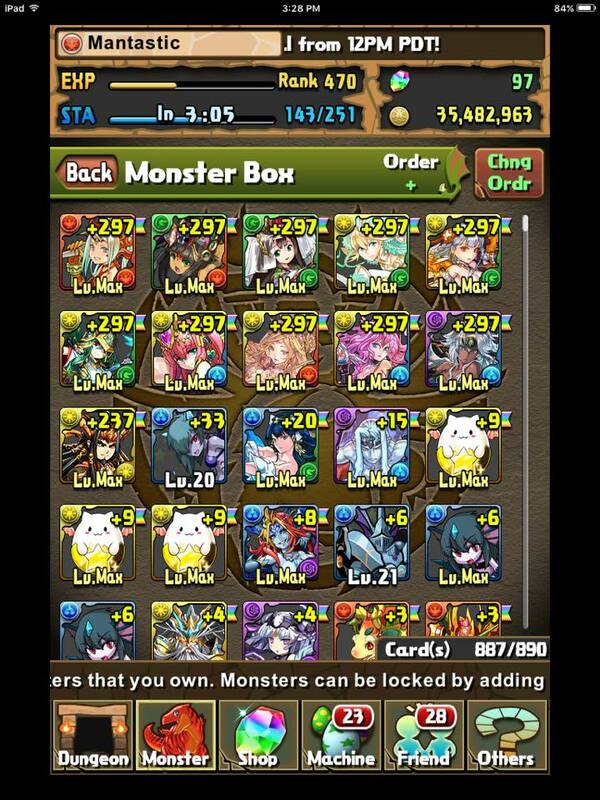 I have had great success using her on my Kirin (Sakuya) team for nearly two years. Her lower stat weight along with poor awakenings paired with new descends being anti-delayed have pushed her more out of the top meta teams, but her delay is still invaluable. Her lower exp curve combined with very accessible evolution materials and exceptionally high recovery makes her a boon to a newer account. So what is the point in actually delaying a boss for three turns? Well in those three turns, you cannot die! You can use it as a way to restall for other actives, take your time in killing the boss by avoiding kill mechanics at low hp, or to even wait out nasty bind situations. In short, Echidna allows you to by pass one floor you normally would have died to. Naturally she shines on rainbow teams that require a red sub or mono red teams to take fullest advantage of what she brings to the table; however, she can be used as a free pass to other teams. 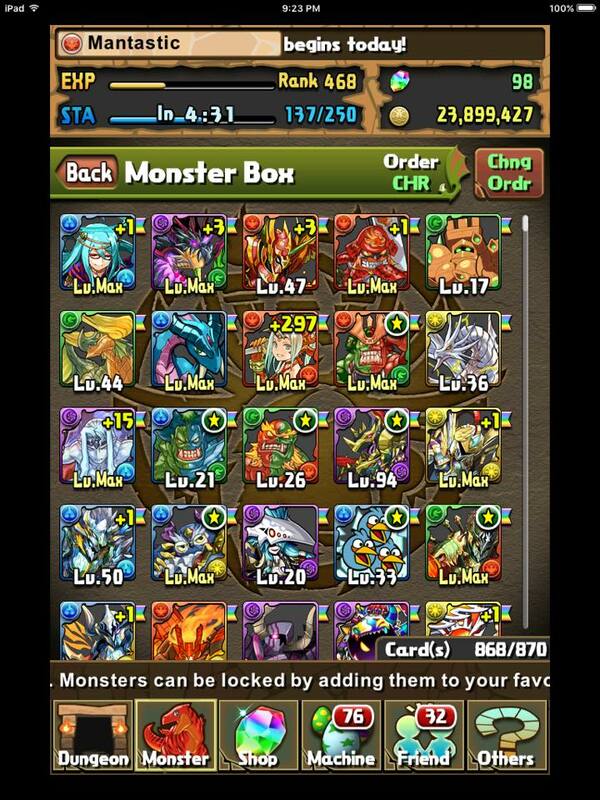 Provided you can take the relative loss of a sub slot, Echidna can still excel for almost all of the content. 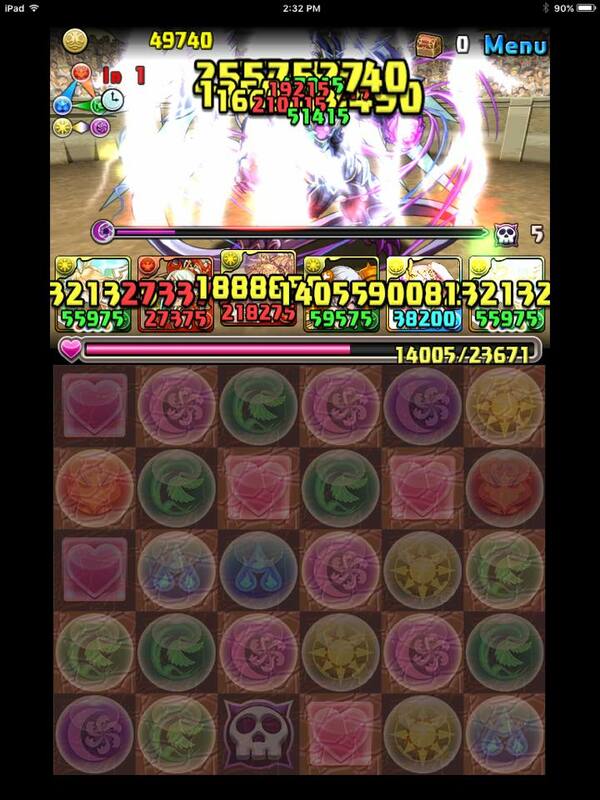 Do not be afraid to use her on a non-boss floor to save actives for a boss that does have a status void shield. Now that you are all excited about getting your hands on one of these beauties, where is the best place to farm them? 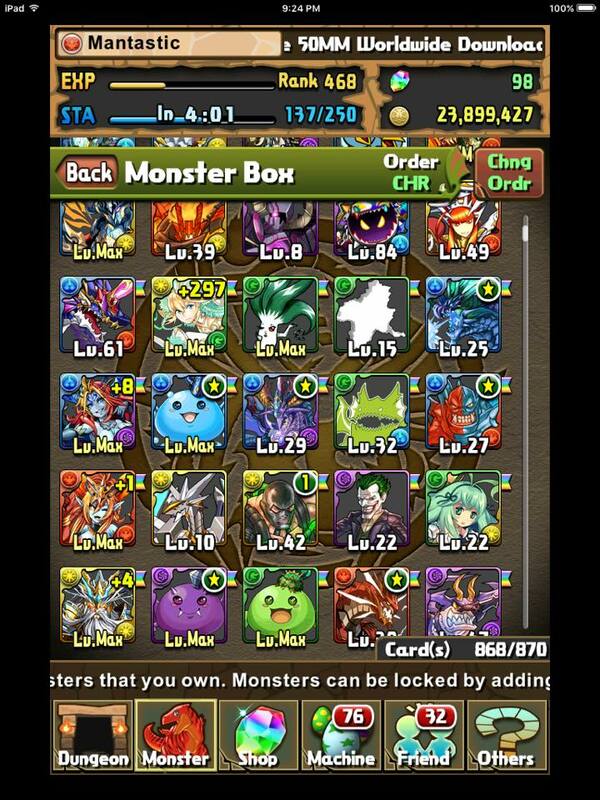 You could try to spam normal dungeons for the 2% drop chance or pray to the Pal Egg Machine Gods for one. BUT, she has her own survey dungeon and to make it even better, she can spawn on the first four floor as well as a guaranteed appearance on the boss. Scarlet Snake Princess has four different difficulties and of course higher difficulty yields better drop rate. It is best to play during an enhanced drop period and she drops in her three star form, Naga. These can be fed into any evolution form of Echidna as a skill up attempt so there is no extra investment required. Many people have been asking what direction to take / what to do as a new player so I will list a relative guide as what you should strive to aim for. Keep in mind that you are clearing content in days it took me weeks/months to reach so things may feel fast forwarded and frustrating at times.